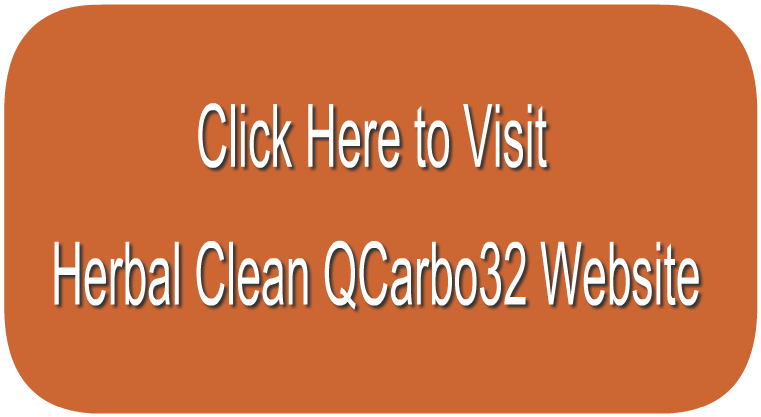 Overview – How Can Herbal Clean QCarbo32 Help You? We decided to update the most popular detox drinks reviews which we have rated over the past five years. So far, the Herbal Clean QCarbo32 still remains one of the most promoted online cleansing drinks for passing a urine drug test on the market in 2019. Herbal Clean QCarbo32 may increase your chance to pass urine drug test. Herbal Clean QCarbo32 is one of the most promoted online cleansing drinks for passing a urine drug test on the market. You will find numerous published advertisements for the product on the 1st page of Google and Yahoo. The Seller, “Herbal Clean”, states that ‘Herbal Clean QCarbo32 is specially formulated for people with higher toxin levels who want to be clean the very same day’. The Seller further claims that ‘Herbal Cleans contains unique blend of herbs and minerals that flushes out all the toxins quickly to help you detoxify your body’. We are of the opinion that, like most of the other “detox” cleansing drinks, Herbal Clean QCarbo32 is only designed to dilute the urine and restore body nutrient levels to normal for up to 1 to 5 hours (known as the “detoxification zone”), not completely detoxify the body. The detoxification zone starts 1 hour after you have finished drinking Herbal Clean QCarbo32 and continues for to up to 5 hours, with maximum effect during the FIRST 3 hours. In summary: the main principals behind this program are to dilute the urine and add necessary vitamins and minerals. The goal is to beat the drug test, not to completely detoxify the body. Since, time of detoxing is only 1 hour; it is highly unlikely to provide any significant body detoxification. Time to clean the urine is 1 hour. • 32 oz bottle Herbal Clean QCarbo32 tropical or grape flavor. The Herbal Clean QCarbo32 contains more ingredients than any other cleansing drink we have seen on the market. Vitamins: C, Thiamin, Riboflavin, B12, Creatine Monohydrate. 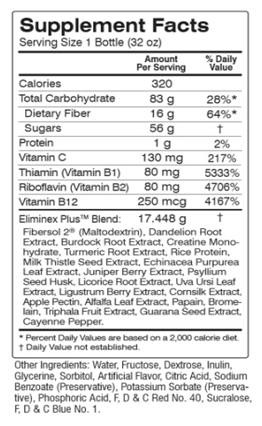 Herb Blend: Firbersol-2, Dandelion Root Extract, Burdock Root Extract, Turmeric Root Extract,Rice Protein,Milk Thistle Seed Extract, Echinacea Purpurea Herb Extract, Juniper Berry Extract, Psyllium Seed Husk, Licorice Root Extract, Uva Ursi Leaf Extract, Ligustrum Berry Extract, Cornsilk Extract, Apple Pectin, Alfalfa Leaf Extract, Papain, Bromelain, Triphala Fruit Extract, Guarana Seed Extract, Cayenne Pepper. Other Ingredients: Water, Fructose, Dectrose, Inulin, Glycerin, Sorbitol, Artificial Flavor, Citric Acid, Phosphoric Acid, Potassium Sorbate, Sodium Benzoate, Sucralose, F,C and F Red N40, F, D and C N1. 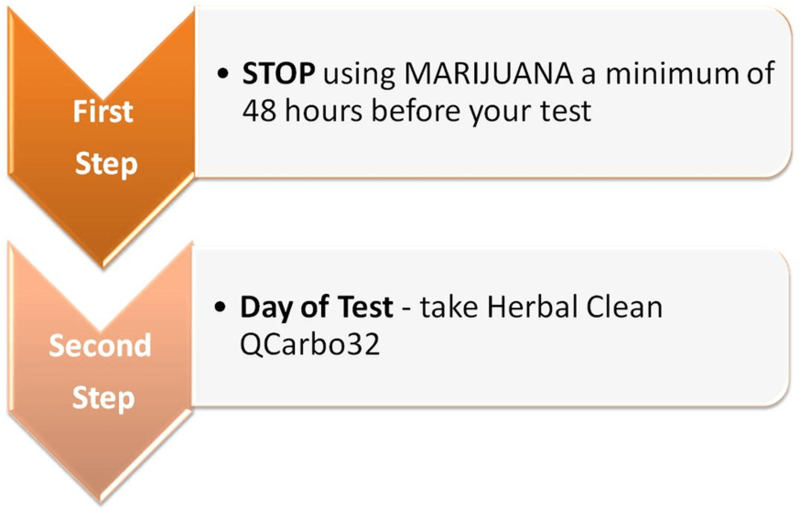 Minimum 48 hours before using Herbal Clean QCarbo32, you must STOP using marijuana. The longer you refrain from using marijuana, the easier it is to mask the toxin in your urine. 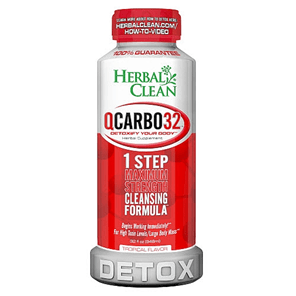 • On the drug test day, begin your cleansing program with Herbal Clean QCarbo32. • Shake the Herbal Clean QCarbo32 bottle well and drink the entire contents. • Pass urine at least 3 times during the following first hour. If you want to be sure of your drug test results, take a home urine drug test first. • Avoid taking any over the counter drugs, large quantities of vitamins, alcohol, acidic liquids such as vinegar or juices, nicotine, caffeine or other unwanted toxins prior to the use of this product. 1. Herbal Clean QCarbo32 may be helpful if you are a light/moderate weed user. This is because the drink contains many vitamins and supplements that increase body metabolism and help clean the body of THC and reestablish body nutrient levels to normal during the “detoxification zone”. 2. Most of the ingredients in this detox drink are natural, which means the risk of side effects is low. 3. Money back guarantee from the manufacture. 1. Results vary from person to person. Factors that play significant role include body weight, life style, individual metabolism and how often and how much marijuana is consumed. 2. Users of this product may experience minor nausea, diarrhea, dizziness or cramping. If you experience any of these symptoms, discontinue the use of the product immediately. 3. Unlikely will work for the heavy user. 4. You must follow the instructions explicitly if you want to increase your chances of passing the test. 5. You must be on a strict diet on the day of the test. Customer support for QCarbo32 is provided by www.Amazon.com via e-mail, and phone line. We found 50% positive and 50% negative product reviews in various blogs and websites. Users with positive product reviews claim to have passed their drug test without any obstacles. On the contrary, customers with negative product reviews claim they failed their drug test even when precisely following the product’s instructions. You can check customers’ positive and negative reviews here. We are of the opinion that Herbal Clean QCarbo32 may work for users with a light to moderate toxin exposure. However, with a heavy toxin exposure, users need to complete more than a 1 hour drug detox program. With a moderate to heavy toxin exposure, we are of the opinion that users need to complete at least a minimum 5 (five) day whole body detox program. Some users are not honest with themselves as to what level of users they are. As a result, they choose the wrong product and fail to pass their drug test. If you want extra help in passing your drug test, Herbal Clean QCarbo32 may be helpful for you. Then again, maybe not – 50%/50% ! Have you tried Herbal Clean QCarbo32? Let us know what you think! i am a heavy smoker and I am going to try this and see what happend..My questions for anyone who knows is.. If you test positive could it show that your levels are down from prior test? also does it take Vicodin or percents out also or just marijuana???? thank you all……I need all the help I can..
Deb..As the main principal behind QCarbo32 is to dilute the urine and add necessary vitamins and minerals, this should work for all substances including marijuana. Usually during urine drug tests Labs measure the exact levels of used substances and compare them to cutoff levels. So, if you know your previous results, you should be able to see the difference. If you are asking about the home urine drug test, you should see the test line getting darker as you clean up. Regarding how effective QCarbo32 is for heavy users, if you don’t abstain for at least 45 days or didn’t complete at least a 10 day whole body detox program, your odds of passing your urine drug test would be 30/70. I weigh about 140 pounds and stopped smoking 3 days before my test I on the second day i used qcarbo 16 and drunk the whole bottle with a lots of water,later that night I took another product called sonne 7 (maybe about 3 to 4 maybe 5 ounces) with a lot of water. On the same day of my test that morning I drunk more sonne 7 about the same amount and with water, about 4 hours later I drunk more qcarbo 16 (the whole bottle) and with more sonne 7 2 hours before my test and ate nothing that whole day what are my chances of passing ??? Amanda..I am afraid that none of the detox drinks would be effective enough in your case to drop your THC levels below cutoff levels because of your heavy THC exposure. There is a good chance that your urine sample will be over diluted resulting in failing your test. If you are lucky, you might be given a chance to re-take your test. In this case, if you have enough time until your test, I would recommend to be more prepared for your test by completing at least a 10 day whole body detox program. Please read more details here. If you don’t have enough time, we have seen that some heavy users try using synthetic urine, if the urine drug test is unsupervised. I wish I could give you better news. Good luck with your test results. Mike.. You can have light breakfast, but no lunch though. Don’t forget checking your THC levels with a home urine drug test in 1 hour after drinking QCarbo32. This will show if you can pass or not. I was given 6 days to get cleaned before a pre-employment drug test. I want to say Im not a heavy smoker but smoked every night. I stopped smoking for this 6 days and drunk a lot of water and exercised every morning but stopped 2 days prior to the test. on the day of the test, i drunk qcarbo16 followed by at least 50oz of water… what are the chances i passed? Nia..I am afraid that using QCabro16 won’t be effective enough to drop your THC levels below cutoff levels because of your prolonged and heavy THC exposure. Using marijuana everyday is considered as heavy THC exposure and without proper whole body detoxification, you might test positive for THC from 45 up to 90 days since your last use. I wish I could give you better news and good luck with your test results. It worked for me! I knew a test was coming, so I was about 20 days out from my last smoke. Still testing positive. I am on the heavier side, so I knew I needed more time to get clean. I got 2 bottles of the 16oz Qcarbo and started drinking. A LOT. 1 bottle down with a liter of water. 45 mins in took a test and it was positive. Started 2nd bottle and another liter of water. A little over hour from the first bottle, I tried another test and it was negative! Took 5 test total all negative. Drink A LOT of water to help keep the brightness of the yellow in your pee to a lighter color. Only down side for me was I had a quizzy stomach for most of the day. But I will take that over failing a test anytime. Juan..If I translated your question correctly that you are facing a blood drug test, you shouldn’t have any problems with it as marijuana is detectable in the blood for heavy users up to 7 days since their last use. As you abstained already for 45 days, your THC levels in your blood should be below cutoff levels. QCarbo16 is only effective for a urine drug tests in some cases. It doesn’t increase your chances of passing the blood drug test. My test is at 8:30am. What time should I drink the detox? Burt..Most detox drinks like QCarbo32 are effective for 5 hours with the best results seen at the 3rd hour. So, it should be taken a minimum of 1 hour before your actual drug test. Don’t forget to check where you stand with a home urine drug test in one hour after drinking QCarbo32. This will show if you can pass it or not. Im a heavy smoker, I have not smoke weed for 20 days though. i have been cleaning my body in many other ways like running and eating clean. Please help me, my drug test is in 10 days. Weednnie..Like most “detox” drinks QCarbo32 does not detoxify your body from unwanted toxins. It only helps to drop your THC levels for a short period of time. QCarbo32 is only effective for 5 hours with the most effective being the 3rd hour. So, unfortunately drinking QCabro32 15 days ago won’t help you to drop your THC levels. QCarbo32 is more effective for light and moderate users. For heavy users it might be helpful if they abstain for a minimum of 30-45 days or complete at least a 10 day whole body detox program. In your case, without knowing your Bio and life style, I would say that you might test positive for THC from 35 up to 9o days since your last use. I would recommend checking where you stand now with a home urine drug test after abstaining and cleaning naturally for 20 days. If you still test positive, you might consider completing at least a 5-7 day Toxin Rid whole body detox program. Please read more details here. Don’t forget to check your THC levels after completing the detox program again. We have seen that some heavy users try using synthetic urine as their backup plan, if the urine drug test is unsupervised. I’m planning on taking my drug test on the 10th or 11th because I got orientation on 10-12-18 I stop smoking on the 10-7-18 so is 4 or 5 days of not smoking and drinking water will it help to boost my chances of passing once I drink the qcarbo32 the day of. Donnell,..As you didn’t provide your Bio, life style and smoking history for the last 3 months, it is pretty challenging for me to say if QCarbo32 will be effective enough in your case to drop your THC below cutoff levels. Well. I would say if you are a light or moderate user, using on your drug test day QCarbo32 might be effective enough for passing your test. However, if you are a heavy user, using QCarbo32 will increase your chances of passing by only 50/50. In this case, I would recommend rescheduling your test and detoxing your body properly with a whole body detox program. Please read more details here. If you cannot reschedule, you might try go ahead with QCarbo32 and hope that it will do its’ trick. Don’t forget checking your THC levels with a home urine drug test in one hour after taking QCarbo32. This will show the outcome of your test. I’m 21 years old, 5-11′ roughly 150 pounds. Have smoked every day for ~1.5 years (dab pen all day, bowls/dabs after work). Quit smoking about 1.5 weeks ago as well as already have taken a 5 day detox earlier this week. Waiting for my drug test date and I will use Qcarbo32 a couple of hours prior. Only question I have is that my body absorbs a lot of water and I can drink until I’m ready to puke however I NEVER have to pee. Will it not be effective if i don’t urinate 3 times prior to my test? SirDabsAlot..According to the product instructions, it is imperative to urinate 3-4 times before your drug test as this helps to flush out some toxins. However, if you test yourself with a home urine drug test first and you get negative results for THC, you should have good chances to pass your actual test as well. Are these refridgeratable? Or will that weaken product strength? Adrian..Herbal Clean detox drinks like QCarbo32 do not need to be refrigerated. Heavy smoker, Smoked everyday multiple times a day also a gym rat in great shape who weighs around 180-190 but stopped smoking weed 45 days ago will Qcarbo32 help me pass my drug test tomorrow ? Steve.. If you have a very fast metabolism, you might have a chance to detox by now. I would recommend checking your THC levels with a home urine drug test tonight. This will show where you stand and what you should do next. If you still test positive, on your drug test tomorrow, you might consider taking QCarbo32. Using a home urine drug test in one hour after drinking QCarbo32 will help to find out if you can pass it or not. I am a heavy user and I see it may not work to completely beat the test but will it lower my thc léveles as I just need to show my léveles are low and not hi. Alfred..If you don’t abstain for some time, QCarbro32 might not be effective enough to drop your THC levels below cutoff levels. However, it might help to low them down. I took 1 xanax and 1 adderall recently very light smoker. Not even 1 x per day. If i drink herbaclean carbo 32 3 days after taking the 2 pills mention and 2 days after smoking. Again, very light smoker. Should i be able to pass? Kelly..Light THC exposure is considered to be if a user smokes once a week. So, if you have a light THC exposure, taking QCarbo32 on your drug test day might be effective enough to drop your THC levels below cutoff levels. By using a home urine drug test in one hour after drinking QCarbo32 will show if you can pass it or not. Regarding those 2 pills, it takes up to 3-4 days for xanax and adderall to get out of your system. So, most likely you should be clean from those pills after 3 days of abstaining. I quit smoking marijuana 60 days ago ( weeks ago ) I was an every day user ( 3 to 4 times a day perhaps more ) if I use QCARBO32 will ì pass my test tomorrow??? Walter..If you don’t carry extra weight, you have a good chance to being clean by now. I would recommend checking your THC levels with a home urine drug test before you go to your actual test. If you still test positive, you might consider drinking QCarbo32. Don’t forget checking where you stand in one hour after taking QCarbo32. This will show if you can pass it or not. Kiersten.. I think you have a good chance to being clean by Tuesday. 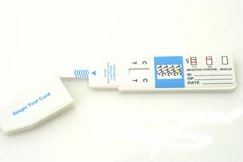 I would recommend checking your THC levels with a home urine drug test on the night of your actual test. If you still test positive, you might consider using QCarbo 32. By using a home urine drug test in one hour after taking QCarbo32 you will know if you can pass it or not. HellO I was smoking almost everyday prior to this past Monday the 19th and I took a QCarbo20 with the pills on the 19th because I had a drug test but it got rescheduled to this upcoming Monday the 26th. I have done the certogel method 3 times in one day on home tests, my urine is clear but the tests still come back negative. Do you think the qcarbo32 will do the trick, this is a supervised drug test. Mann.. I think your chances of passing your urine test using QCarbo32 are 50/50. If you have an extra QCarbo32 bottle, you might try experimenting by taking the drink a couple of days before your test, then perform a home urine test one hour after you drink it to see how effective it will be. This will help you to find out if this approach will be effective on your drug test day or not. Good luck with your test on Monday. Does Q carbo 16 hide the detection of alcohol and nicotine? Rachel..Most users use QCarbo16 for marijuana urine drug tests. However, as the main purpose for this kind of “detox” drink is to dilute urine in order to pass the cutoff levels, it might be effective for alcohol and nicotine as well. If this is not a random urine test, you need to abstain from consuming alcohol for at least for 48 hours in order to drop your alcohol level below cutoff levels. But not that simple for nicotine though. If you didn’t smoke cigarettes much, nicotine (nicotine metabolites) can be detected up to 4 days since your last use and for daily smokers, it might take up to 3 weeks to detox properly. So, if you are an everyday cigarettes user and have enough time until your test, you might consider completing at least a 10 day body detox program. Please read more details here. So I’ve smoked since I was about 13, I’m now 20, weighing about 145-150lbs, I stopped for about 30 days, then took a few puffs over about 3-4 days. Then found out I got a job offering, so I picked up the No Flush Niacin (500mg) a week ago this Sunday. So I’ve been taking it for roughly a week now(An still will up to my test date). I take around 3-4 pills every six hours on top of plenty of water and cranberry juice-(2 12oz cups a day). My test is on Thursday next week 1/17/19 at 7am. Will taking QCaRB032-Herbal Clear at about 5;30am, also urinating a couple times prior to taking my test. Will I be able to pass with no problems? Seeing that at the 3rd hour after drinking the QCaRB032 is the best results. I also took a home test today and it was positive, then a second one about 20mins later and it was showing I was still positive but the second line started to appear that I was becoming negative for the home test I took again. Spankmaster..I think you might have a chance to drop your THC levels using QCarbo32 on your drug test day. However, to be on the safe side, I would recommend performing a test run with QCarbo32 before your actual test if you have an extra bottle of this detox drink. If you test negative on a home urine drug test in 1 hour after taking QCarbo32, this approach should work on your drug test day as well as you still have 5 days to detox naturally. Used to be a daily smoker. quit for 2 weeks, then smoked once, now have quit, this being my 4th day, I have drank a lot of water, watched my diet for the most part (no greasy foods, healthy oils only to cook) and am going to use qcarbo32 before my drug test which could be today. How likely am I to pass following instructions precisely? Michael.. I think your chances of passing are 30/70 because you have a high THC exposure and did not have enough time to detox properly. I always recommend checking your THC levels with a home urine test before you go to your actual test. This helps to find where you stand and what you should do next.